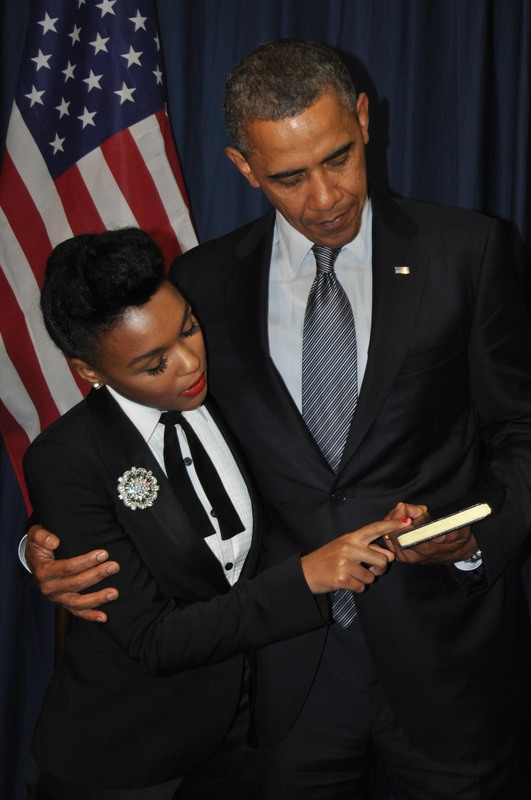 How Did Janelle Monae Influence, Inspire President Obama During Chicago Show? We already know that President Obama loves live music and knows how to weave it into the fabric of his presidency. And now we know a little bit more after hearing him express his thoughts about experiencing Janelle Monae live during a recent visit to Chicago to raise support for the 2012 campaign. The video is short but Mr. Obama’s comments do give us a little bit of insight into how Monae’s live show moved him and even influenced foreign leaders during a recent state dinner. And I wonder if he felt the same way during the Motown show? But the fun wasn’t only had by the President himself, because the inspiration seems to be following in both directions. It’s interesting to think about how the inspiration and influence flows both ways, from artist to fan and vice versa. We’ll be diving deeper to discover more details about Monae’s live performance and her own emotional experience. And I’m really curious to explore this, especially after I saw her last year at SXSW 2011, a show that turned out to be one of my favorite shows of 2011. All this said, as you know, we’ve been on a mission to explore how shows like these and all of President Obama’s live music experiences have influenced his political and presidential decisions these last three years. And in the near future we’ll be sharing “a special interview” with President Obama for our Live Fix community since we’d like to know how the live music experience will inspire and empower the upcoming campaign. How do you think live music influences President Obama? What role has the live concert experience played in helping our presidents shape our country’s past, present and future? Let us what you think and share your own concert experiences in the comments below, on Twitter @livefixmedia, on Facebook or call the concert fan hotline at 773-609-4341, and we’ll include them in a future episode of Live Fix Radio.